Let’s say you want a gaming chair but too many colors and logos make you feel like a kid again. There aren’t too many options left, right? Fortunately, a high-end gaming chair doesn’t have to cost a fortune, but the classier it looks, the more you start worrying about. What if you mess up the installation; what if you spill something on your high-end leather? To eliminate most of the human error-related concerns and to give your gaming setup a bit of flair, we suggest taking a closer look at the elegant Vertagear SL5000 Racing Series gaming chair. The SL5000, now in its Rev.2 version, combines a gaming chair design with superior engineering and luxurious detailing in an effort to spruce up the traditional gaming setup that most people have these days. The Vertagear SL5000 is perhaps a good fit for old-school gamers. It’s also a best buy if you’re looking for something that requires minimal assembly effort. The Vertagear SL5000 is a beast, so if you need something that holds its ground day in and day out this is one of the more durable models out there. Last but not least, due to its design, the Vertagear SL5000 will fit the average-sized gamer pretty well. So, unless you desperately need an extra-wide seat, this chair will add a bit of class to your gaming setup or to your office. The effortless assembly is probably just as important a feature as the luxurious traditional design. The slide-in design allows anyone to build the chair within minutes and without any special tools. The monochromatic PVC leather cover may make the chair look a bit dull, but it’s actually quite luxurious. 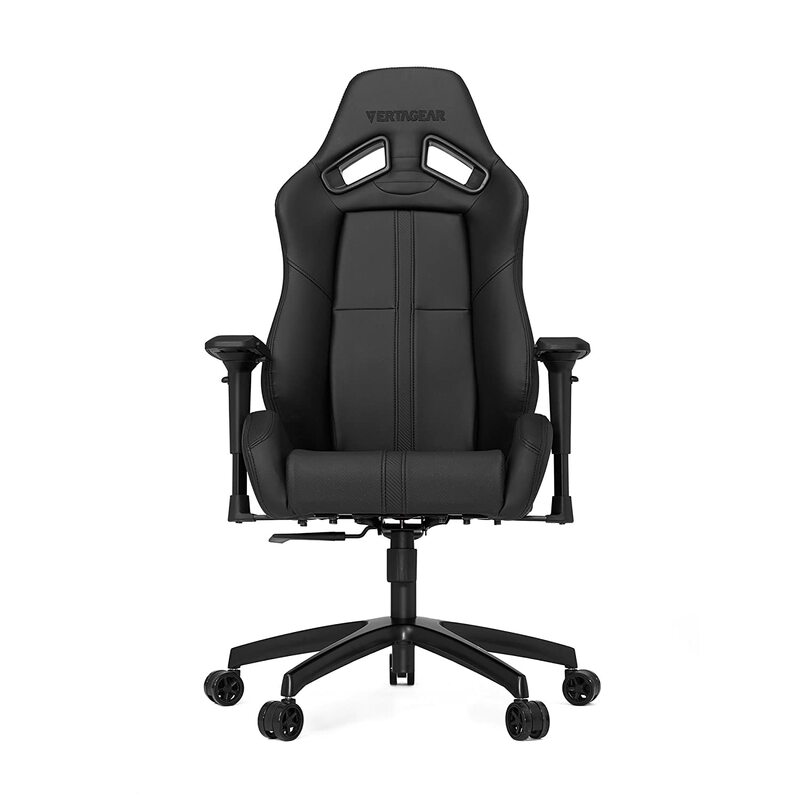 Besides, it does come with some color variety, so if you’re looking at it as a purely gaming chair it is possible to order a Vertagear SL5000 in three other color combinations. The chair is equipped with a heavy-duty steel frame that sits on top of an aluminum alloy base. The classic star-shaped base is used for extra stability and superior traction on the floor. The high-quality PVC leather cover is thicker than what you get on most models. It doesn’t have an intricate pattern but it does provide more than enough comfort for long gaming sessions. The package also includes a headrest and a lumbar cushion to help with back support. The armrests have a 4D design with off-the-charts adjustability. Judging by how it looks, what it offers, and how much it costs, the Vertagear SL5000 is an interesting option for any gamer that wants a more upscale gaming setup at home or the office. This chair is one of the easiest you’ll ever have to assemble. The slide-in design is self-explanatory and requires almost no tools whatsoever. The cushions are easy to attach or remove and the 4D armrests are not hard to figure out either. However, you might want to pay close attention to the instruction manual if it’s your first time seeing 4D armrests. Of course, not everyone appreciates a luxury chair when it comes to gaming setups. For some, it doesn’t say professional as much as it screams pretentious. If you’re thinking the same thing, then perhaps the Vertagear SL5000 is a bit much for you. Still, it’s not the end of the world. For roughly the same price, you could get your hands on a very cool race car-inspired gaming chair that goes well in a room full of PC parts, component boxes, and merchandise from your favorite E-sports team. The DXRacer OH/RV001 is a very nice alternative. It has about the same weight limit, and you also get an ergonomic backrest, lumbar cushion, and good stability. What makes this DXRacer gaming chair even better is that its classic green over black design blends in perfectly with many popular gaming gear and manufacturers like Razer or NVidia. Is it as durable in the long run as the Vertagear SL5000? – It’s hard to tell. But, if you just want a gaming chair that lets people know right off the bat what you’re into, the DXRacer OH/RV001 can do that without putting a dent in your wallet. The Vertagear S-Line SL5000 doesn’t look like a traditional multi-colored gaming chair, but that’s because it is designed as a luxury item first and foremost. The elegant exterior, the simple slide-in assembly, and the high-quality PVC leather cover make it a great addition to a home gaming setup or an office. It lets you have your fun while making you feel like a real pro at the same time.